As the hardtracking staff [at Sneak Adtack] noted yesterday, corporate gunsel Rick Berman’s stealth non-profit, Center for Union Facts, has been running this ad lately in the Weekly Standard. Did Berman actually acquire the rights to that photograph? ‘Cause it sure doesn’t look like it from the ad. Thanks for the email about the ad. While the Robinson photo may be in the Getty library, the original copyright expired in 1997. We accessed the file from the Library of Congress. 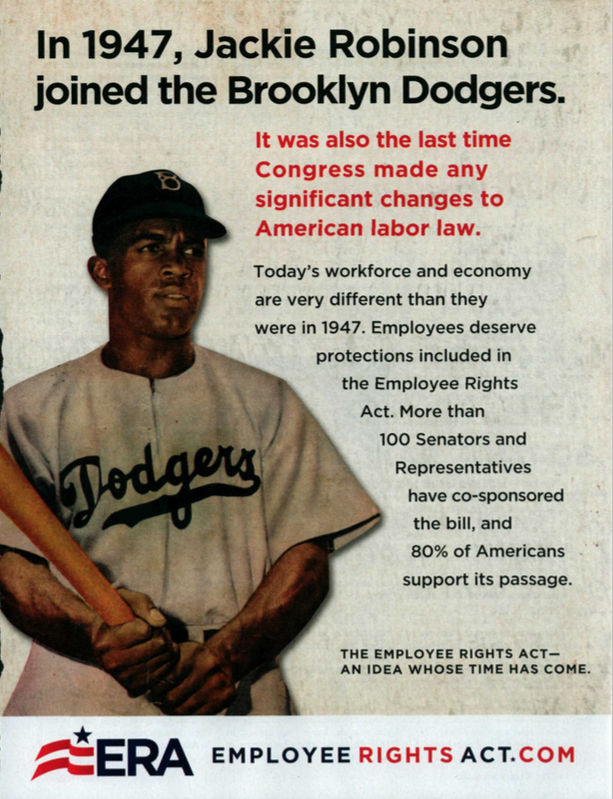 Would Jackie Robinson really want himself associated with some union-busting creep like Rick Berman? We think not, public domain or otherwise. This entry was posted in Uncategorized and tagged Berman Exposed, Campaign Outsider, Center for Union Facts, Center for Union Whatever, Employee Rights Act, Getty Images, Jackie Robinson, James Bowers, Rick Berman, Sneak ADtack, The Weekly Standard. Bookmark the permalink. But isn’t it the responsibility of his estate to protect his image? Where are they? Have you contacted them for comment? But more to the point, what statute would the estate have use to control the use of the photo once it has entered the public domain? Certainly not the copyright laws. That ship has already sunk in the west. No – not much they can do about it, Mudge. I guess they could go to lawsuits . . .
You can sue anyone for anything, but you have to have a cause of action. With the photo in the public domain, the copyright protections are no longer available. Invasion of privacy? A deceased person has no presumption of privacy. So that angle is dead. Trademark? Unless he trademarked his name AND his estate continued to maintain that trademark, including the renewals every five years, that cause of action is going nowhere. So on what grounds would there be for a suit…and only the estate would have any standing at all. Hey, Mudge, keep your shirt on. I couldn’t have been more tentative about it – no need to get in a lather. Not in a lather, John. Just pointing out that your veiled indignation has little or no basis in law, which puts you in league with Don Quixote and his windmills. And we know that you turned in your washbasin and light saber years ago. Oh, Mudge – you do go on so.